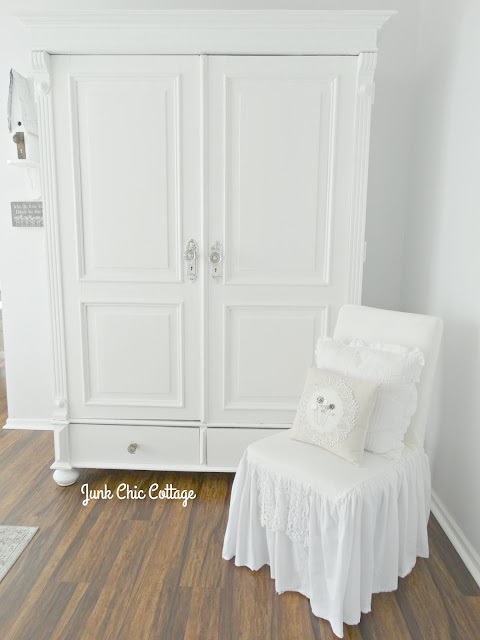 Remember our vintage living room tv armoire in the old house. Well it got some white paint. No shocker for any of you that know me that something got painted white lol! 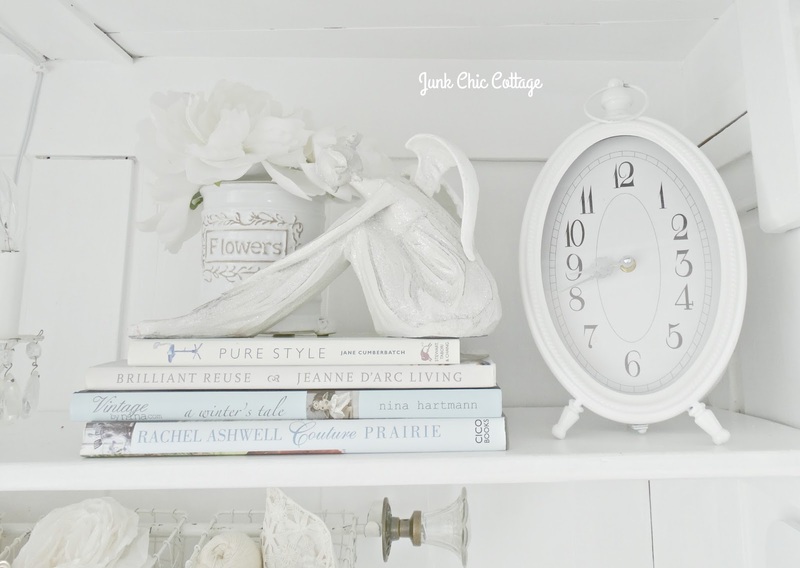 Not only did it get painted white it was re loved into my new home office. Yep Terry and his tools transported this TV armoire into an office space for me. Like I always say gotta love a man with tools that knows what to do with them! I loved my old desk so Terry just removed the legs and we were able to fit it inside the armoire to be used again. Terry was able to hook up one of my small chandeliers inside the armoire for lighting. Very pretty lighting at night when I am on the computer. We hooked up the old curtain rod with vintage door knob ends and my baskets for some storage of my small office stuff. 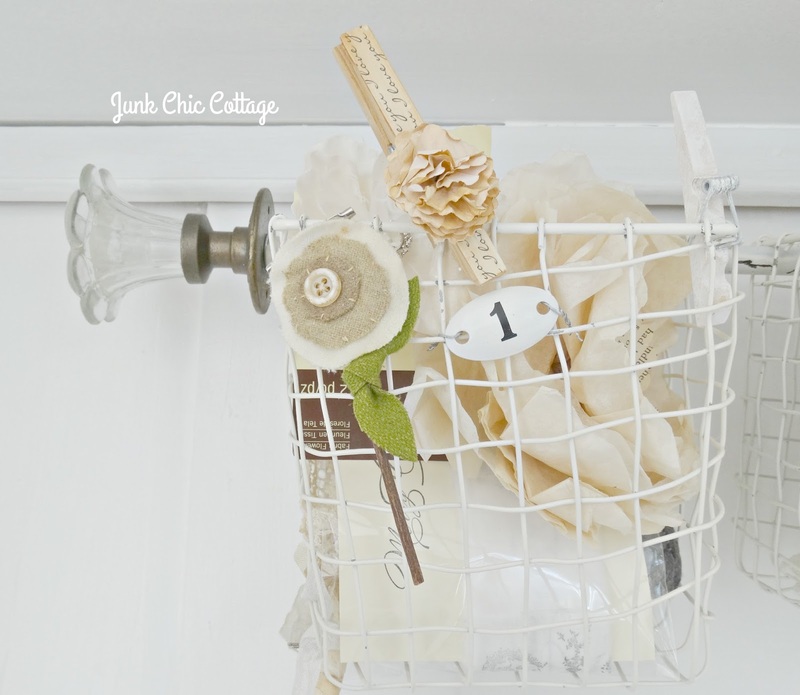 Love that some of my storage things are in plain sight but still look pretty and organized. 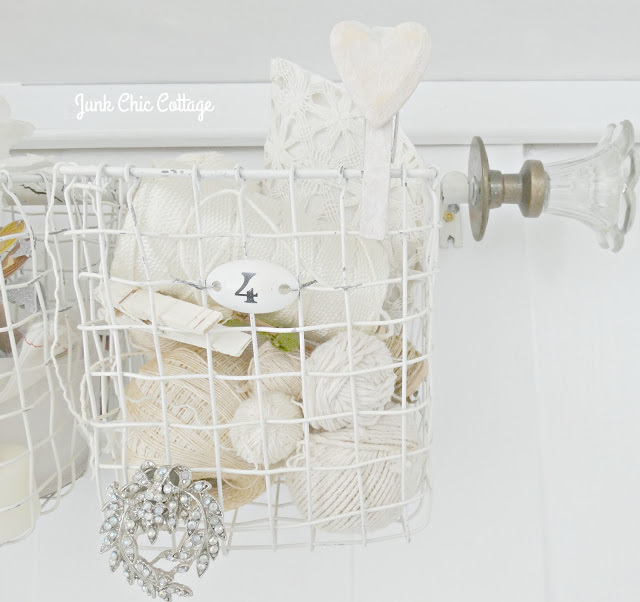 I found this wire basket at Home Goods and painted it white to hang for some of my magazines. My decor vision was just to surround myself with the things I love and have storage. I still have my comfy slipcovered office chair. Theres my little photo bomber Cooper. More about him later in this post. Now that little space in the back of my living room that was an awkward space is now my new home office. I love that the armoire flows with my living room and still gives me an office. 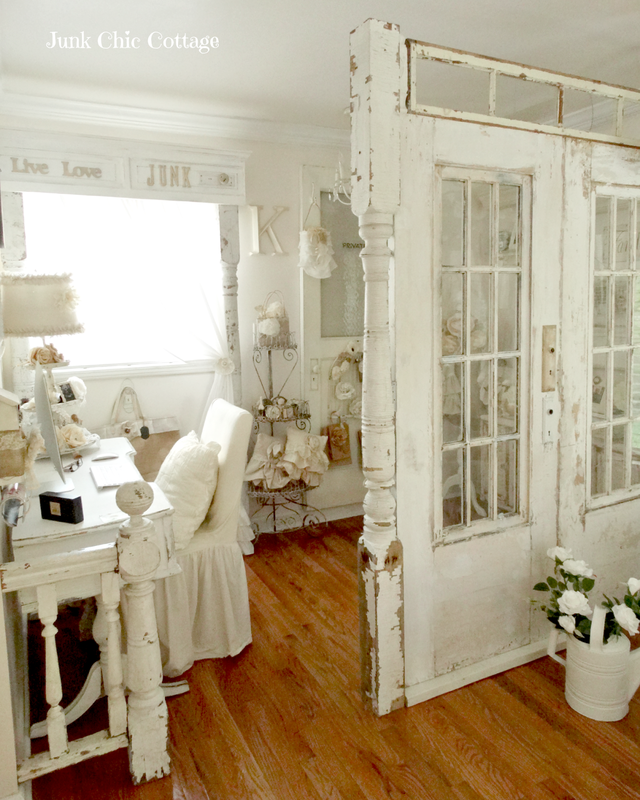 I can close the doors and my office looks like an armoire that is part of the living room. So there is another area in the new cottage that I could show you. I will have more in the coming days. The new cottage is coming together nicely. Now for an update on this little guy. He is doing great. You would not know this guy has terminal cancer. He is happy and playful and just a big love. He had his one month check up and blood work up a week ago on his new cancer medication. The Vet is pleased with the results and is cautiously optimistic that Cooper is reacting well to the drugs. We are hoping with all hope this will give us months with this little guy to maybe even up to a year. We just pray he will stay happy and comfortable like he has been for whatever time we get with him. He is just a big lug of love. Love the armoire turned office. So perfect. That office armoire turned out fabulous! Glad to hear about Cooper. Kris, that is what I call transforming every inch of that armoire. What a great office! I'm so glad that sweet boy is doing well. It's beautiful! Now that's repurposing and downsizing! I just adore your Cooper. You know I think you two are both angels and Cooper was sent to you for a reason. Because you have so much love to give. Wowwwww... Your new office is fantastic! Very clever idea to use the armoire. I love it in white. This post makes me so happy, Kris! Your Cooper looks straight at you with nothing but adoration, it's obvious! That armoire!! Oh my, yet another great project with at least 4 or 5 projects within - a desk, undermount keyboard, chandy light, pole with baskets, and that magazine rack. Brilliant way to contain yet keep your own space. I really, really like it. I agree with the comment above, that you should have your own show or store. Such creative spirits. I am soooo glad that Cooper is doing well. Love his sweet face. Great use of a piece you already had...wish my computer desk space was so inviting...but a lot of it undesirability is in the disorganization. 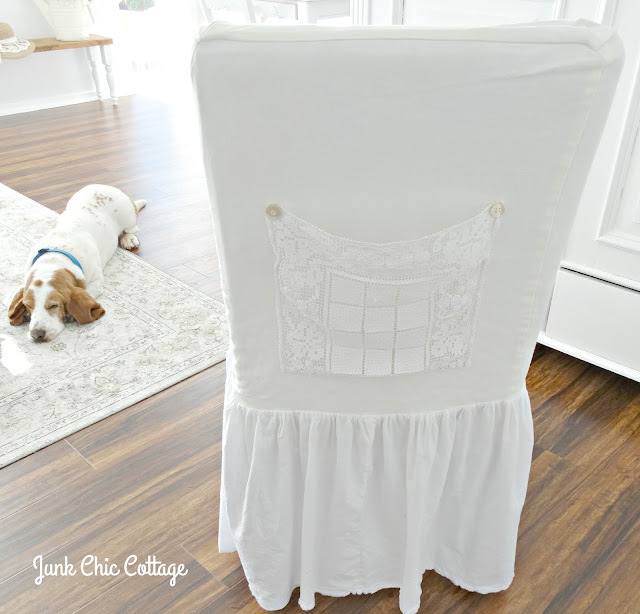 I am going to postpone a chair project completion by a day, in order to organize my craft room enough to find the fabric I want to use on the chair. LOL. Have a blessed day. LUV the office armoire. :) We had one in our old home . Grand idea . Aaawweeee!!! Look at that little face! I am so happy to hear he's responding well to medication. More important , I think it's luv he's responding to. Lots of unadulterated luv!! The best medicine. 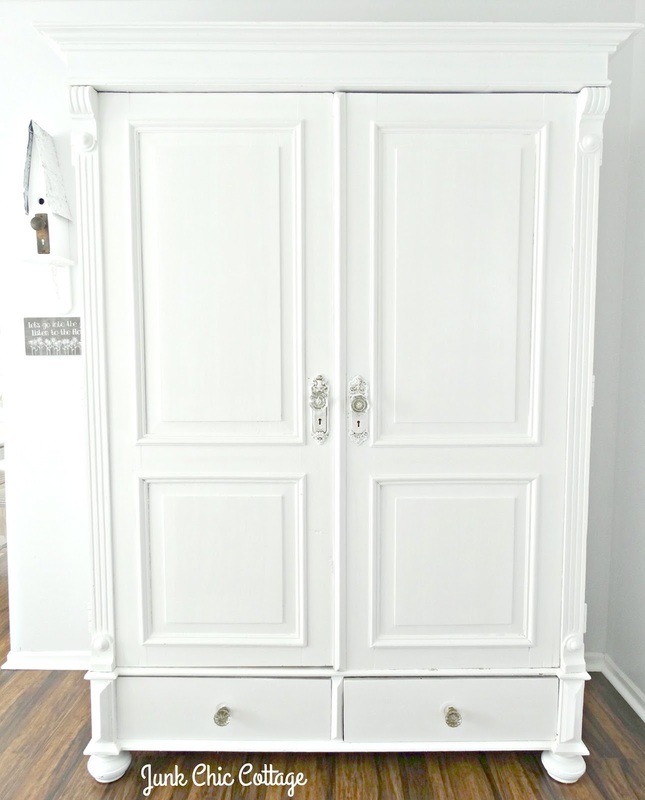 Your armoire looks amazing Kris! Love that you put your old desk inside so you can still use it. That's just pure genius! I'm so glad Cooper is doing well. He's such a sweetie! Your office is great and looks terrific. You always make magic with your decorating. Terry does a wonderful job on re-purposing your furniture. Cooper looks so good and i am so happy that he is responding well to his medication. He looks like a lover - I know how much love you give him. He is always in my prayers. Love the house and all your decorations and can hardly wait to see the rest of it. OH KRIS!!! Such big reveals today! As I type, my husband is outside with his drill making a storm entrance in the back of the kitchen. I think it will be gorgeous! What a great idea! That is the perfect work/play station, and so chic! And with a chandelier to boot? You've got it made. But of all the surprises, SUPER DUPER COOPER looks amazing. He looks happy, healthy and ready to relax by your side, faithfully. Thank GOD for the care you've given him. Enjoy your day! Your home is fabulously you, all you. I love all the beauty you have created for you and terry. I bet you have fallen in love with your new placement. As for Cooper I believe he is doing so well because he is receiving love beyond love. I am looking forward to whats in your future and future features. (Suddenly my acount was all gone from Google, even though I use it every day, grrr!!). I Think both you and your hubby are great with finding out things that works. Your office is absolutely awesome and I wish I could do the same here. It would be a blessing to Close the doors and not having to see it all the time, lol. What a great dog he is. So cute. And it's great that he's as well as he is now. Such a great idea for a home office, Kris! 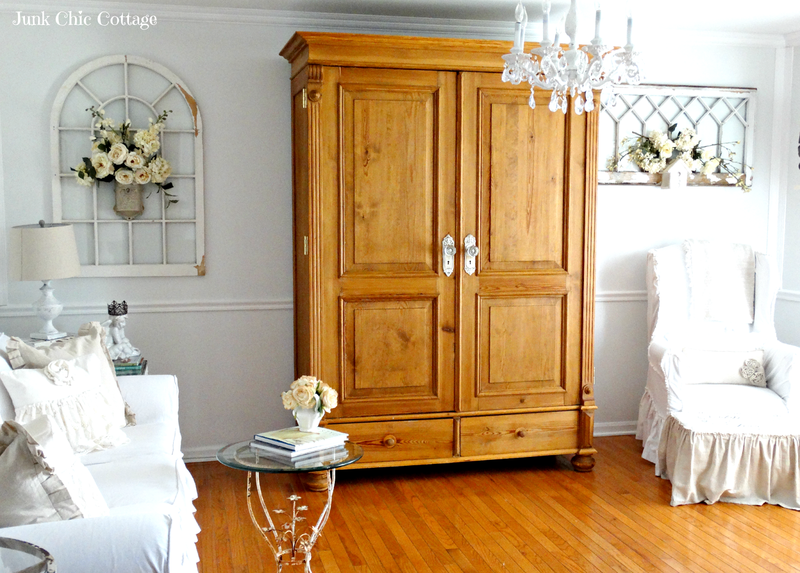 The armoire provides a pretty place to work, and nice that it can be closed off if needed. I'm not sure which is more adorable- Cooper or your new office armoire! Okay, it'll have to be a tie. Everything is looking so great...I hope you are feeling settled and at home in the new house. So glad Cooper is doing well and you is happy. Your new office looks great! Kris - Great news on Cooper. He's so cute. Your new office is gorgeous. You are really moving along quite nicely!! Kisses to Cooper :) awesome office and yes you have a very handy hubby! Oh my - just gorgeous - as I knew it would be. It is wonderful to see you so happy! Rejoice! Love your new office Kris, and of course it has a little bling right :-) Oh no so sorry Cooper was ill. Glad to hear he's feeling better! How stunning! I love the chandelier inside!!! I'm glad to hear Cooper is feeling better -poor guy! I'm so glad to hear Cooper is doing so well....I think about him all the time and wonder how he is doing?!?!? Your armoire turned office is super cute!!!!! I love the way you have made the inside just as pretty as the outside. I just love the close up pic of Cooper! He has the sweetest face. I'm so glad to hear that he's doing well. Your home office looks great. I know you must love having everything organized and back in place now. Love it all , Like your office ,but mostly the dog! Love love love your sweet new office. How creative of you and Terry to put your desk in there a gorgeous chandelier also*** when its open its so pretty, you may never have to close those doors :) perfect office space. Cute picture of Cooper, he is a doll and I am so happy he is still feeling good. Enjoy your time with him. have a great day Kris!!! Hi Kris! I have been taking a break from blogging and haven't been spending much time on the computer, but I had to pop on over this morning to see what you have been up to. Wow! You have been busy!! The new place looks just amazing already. I can't believe how much you have gotten done in such a short amount of time. Your armoire turned office is just perfect. Cooper looks fantastic (that picture is the best!). So happy to hear he continues to do well. Take care, my friend. I just love what you did to create a stylish practical home office. It turned out so beautiful and functional too. 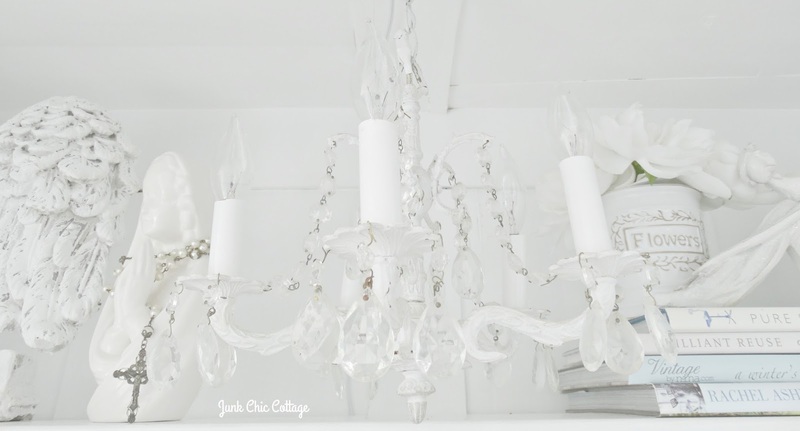 And with the sweet little chandy inside - just darling! that Cooper is doing well. I just want to squeeze him...those ears...love them! Thanks for sharing all of your teamwork! 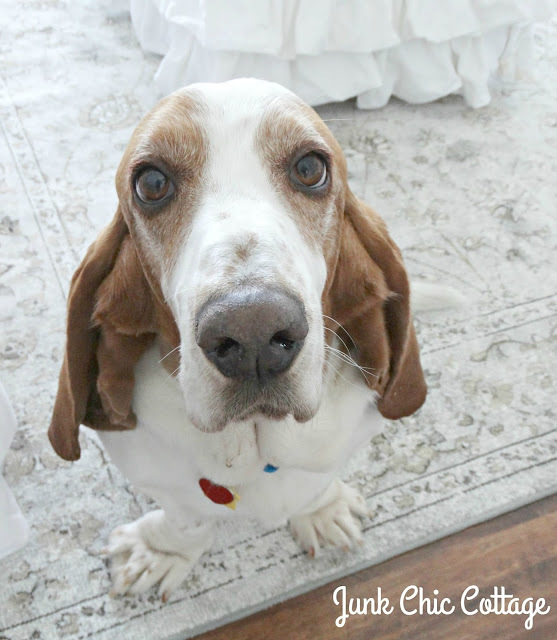 All I want to do is kiss Cooper's snout! What a cutie! And that armoire! Oh my, what a fabulous repurposing job you and Terry (ok, it was mostly Terry lol) did. Oh my goodness! Cooper's big eyes say it all! He's adorable and I'm so happy he's responding well to his medication. Here's to many, many months with this sweet boy. Your office space looks great. 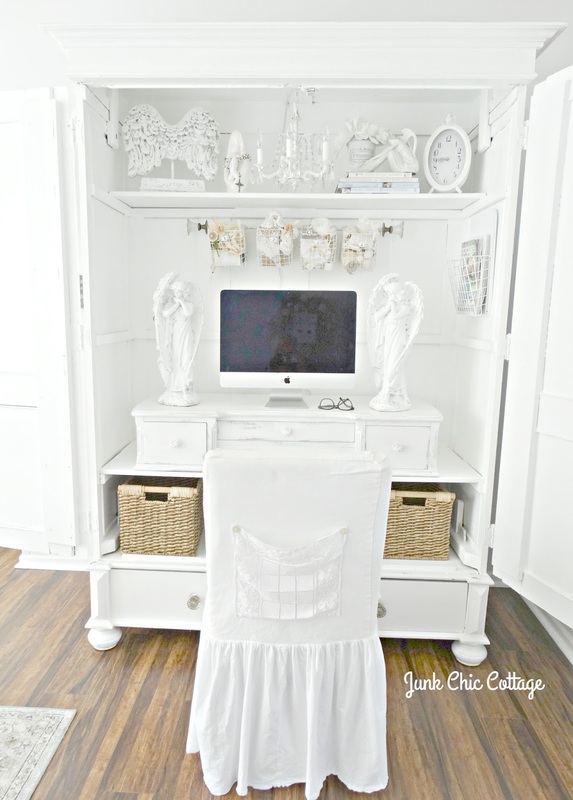 I love how you repurposed your old desk and put a chandy in the armoire! C-u-t-e! I agree with your sentiment that you gotta love a man with tools who knows how to use them! I'd be lost without my guy turning my ideas into reality. Awe, Cooper is just a cutie and those adorable eyes! What a fabulous office space, Kris and complete with chandelier! How clever to cut the legs off of your old desk and repurpose it in the armoire. Your office is gorgeous. I am glad Cooper is reacting well to the meds. He is a sweetie. Looks great! So glad Cooper is doing great! Kris you painted something White - say what???!!!! All looking Kris styled fantastic, very clever storage solution. Cooper is thriving because of the love you and Terry provide. You truly are an Earth angel Kris. Amazing...you are amazing. What a great idea for your office. You and Terry should team up and do a book or tv show with all this creative talent you have!! It looks amazing. I am so happy about Cooper. Thanks Kristine. I hope he can be with us for a long time. He is just the sweetest little guy. That's good news about Cooper. What a sweetie he is. Love your office space Kris and especially how you've used what you already had. How could you not use that gorgeous desk! So glad to hear Cooper is doing well! That is just the sweetest face. 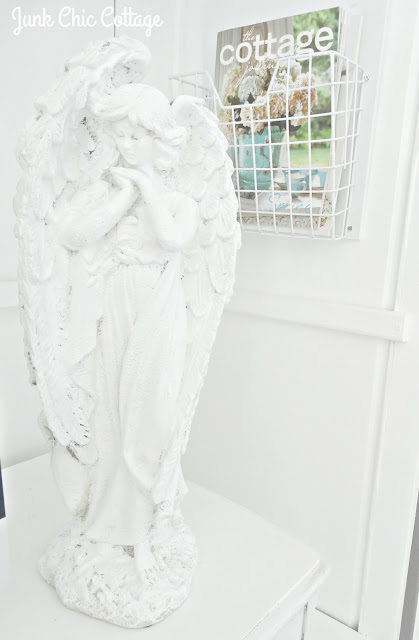 :) When I saw the before pic of your armoire, I just knew some white paint was going to be involved. Lol! It looks so good!!! You were smart to incorporate your old desk and that chandy is the crowning touch. Beautiful! Hi Kris, I have been missing for a long time. I love what you are doing with your home. You and Terry are showing great team work as usual. Love the office, screams you. I also adore what you have done in your dining room. I think of Cooper often, I'm thrilled he is hanging in there. I will be back soon telling everyone what's been going on. First, wonderful news about Cooper. And now, that office- awesome! When I was trying to figure out how to decorate the door that I have behind my desk in my guest room, I was thinking about the rod you had hanging in your old office. I see you incorporated it into this office too. L O V E it all!!! Oh its looking so very pretty!!! What a sweetheart Cooper is!! Could just hug him! Terry did a fabulous job with the armoire, Kris. You have a wonderful office space in your new home even without having a separate room. The chandalier inside works so well and is a lovely detail. It's great that sweet Cooper is doing so well. I hope you'll have a lot of time with him left. I am loving your new office space, and that hubby of yours sure is a keeper!! My old girl, Lily, was diagnosed with cancer as well....they told me I may get a year and a half with her, if I was lucky. That was four years ago. And she's still full of vim and vigor!! Cooper is just a little sweet baby, here's hoping you get lots of time to love him. Hi there Kris! Thanks for your visit! You two are having so much fun together! Your new office is genious. 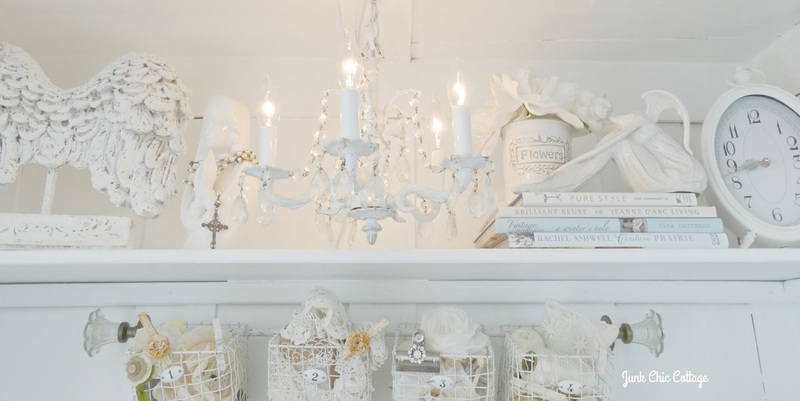 I love the chandy for light. That is one beautiful photo of Cooper. I agree. He does not look sick at all! So fun to see your place come together. Hi Kris - What a great home office solution! Functional and beautiful! I've never seen an inside of an armoire so organized! :) It looks great. Cooper is adorable. Thank you for taking such great care of him during his remaining time... I hope he has longer than expected too! Kris, your "office" is beautiful and how clever to use the armoire. And the desk in the armoire. I don't have an officer, so I am jealous. I hope Cooper continues to do well on the medication. Thank you for sharing at Your Inspired Design Link Party. What a great idea. I love it! Everything is turning out beautiful... Give Cooper a kiss and hug for me! Oh Kris, that adorable face, those ears with all the folds, those eyes that melt your heart. Cooper is a love of a little guy, for sure. I bet he stays pretty close to you when you're working in that gorgeous new office. Great news on Cooper. I hope and pray that he has many, many more days with you. I love your home office. Does the drawer slid out? I love that sweet chandelier inside. Amazing. 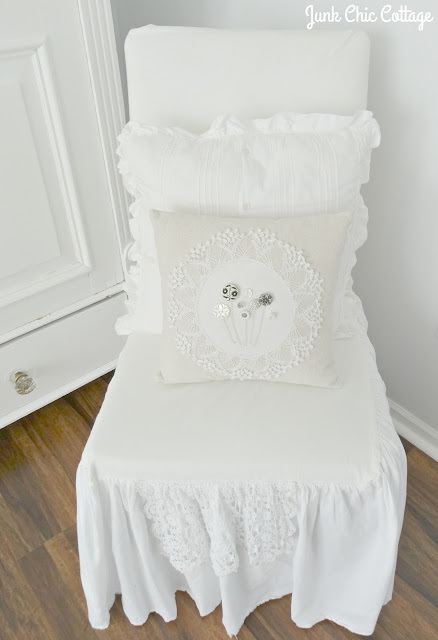 This is so pretty and dreamy with all of the little touches. Great job and thank you so much for sharing at Your Inspired Design! Kris, only you could transform furniture on the inside to make it as pretty or prettier than the outside. The office spot is adorable... and so is Cooper!